DUET Group's securities hit a three year high of $2.15 on 6 September. In an update on the internalization of its management, DUET said its financiers have consented to the issue of the materials for the security holder meeting, which is likely in late October. DUET will pay its managers, AMP Capital and Macquarie Capital Group, $82 million in consideration for the change, and this will be used to subscribe for 41,578,144 new stapled securities at $1.97 each. Sims Metal Management's electronics recycling division, Sims Recycling Solutions (SRS), has acquired the assets of E-Structors Inc in Maryland, USA. Sims said E-Structors is one of the largest electronics recyclers in Maryland, Washington DC and Virginia and provides electronics recycling and document destruction services to companies across the US. Clients include educational and financial institutions, government agencies, health care systems and medical centers, private and public corporations, and national electronics retailers. Founded in 2003 by Mike and Julie Keough, E-Structors engineered an electronics shredding system that allowed the company to offer its clients the security of physical destruction and generated a higher quality of processed material. The company's 160,000-square-foot facility processes over 22 million pounds of material each year. The purchase price is not material to Sims Metal Management, which is also working on SRS recycling opportunities in the Middle East, India and Africa. GWA Group is to acquire API Services and Solutions Pty Ltd, known as API Locksmiths. This follows the termination of the Scheme Implementation Agreement with Q Technology Group on 16 July. API Locksmiths has annual revenue of about $25 million. Its core business is locksmithing services and it also supplies safes, locks and alarms. It has a national network of offices and contracts with major enterprises. The acquisition price is $13.1 million on a debt free basis and will be funded from cash reserves. The deal should settle by the beginning of October. Energy World Corporation increased its revenue in 2011-12 by 32 per cent to US$145.5 million, but profit after tax fell 24 per cent to US$21.1 million. Infigen Energy chairman Michael Hutchinson has indirect acquired 82,500 securities at 30 cents each. Broker Ord Minnett has moved from a lighten to a hold recommendation on Infigen Energy, but with high risk. Based on its 2011-12 results, Infigen still has hurdles to overcome, but looks to be moving on to a more stable and transparent path, says Ords. "In particular, the relentless rise in operating costs is slowing and compliance with the key leverage ratio in the Global Facility appears less uncertain." 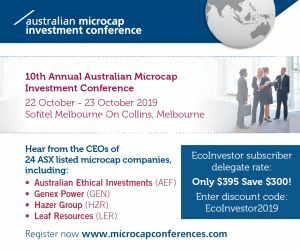 "With bundled prices set to rise with the introduction of carbon, the outlook for the Australian business is considerably stronger than in past years." Solar energy company AFT Corporation saw a significant fall in its half year sales revenue to 30 June, from $13.2 million to $3.8 million. It also reversed its previous profit of $0.79 million for a loss of $0.48 million. For the full year the company expects to have revenue of around $8 million and a net loss of $1 million. CBD Energy's share price continues to decline and on 6 September touched a three year low of 3.2 cents. The company reported a loss for 2011-12 of $21.6 million compared with a profit the previous year of $2.5 million. Revenue fell to $54 million from $164 million. CBD said it expects to return to profitability in 2012-13. CBD also announced a power purchase agreement with TRUenergy for its Taralga wind energy project in NSW. This will now proceed to development with Banco Santander, Europe's largest bank, holding 90 per cent of the equity and CBD 10 per cent. The $250 million Taralga Wind Farm project has approval for 51 turbines and installed capacity of 108 MW. Construction should start later this year. When completed in 2014 it will generate 300 GW hours a year, enough energy for 40,000 homes. TRUenergy will buy all of the energy and Large-scale Generation Certificates. Managing director Gerry McGowan said the agreement with TRUenergy underpins the financing of the wind farm. "The agreement will deliver approximately $300 million of off-take value to the project." Taralga Wind Farm will be Santander's first wind project in Australia. David Swindin, Santander's Head of Credit Markets Asia-Pacific, said "It is one of the few shovel ready projects in Australia with an off-take agreement. "Since 2005, Santander has actively developed projects, provided advice, raised third party funds (equity and debt) and invested proprietary equity in renewable energy transactions accounting for more than 900 MW. CBD have impressed us with their professionalism and entrepreneurship and we are in the process of evaluating other projects they have brought to us." The project partners say they are well advanced in raising the debt required and finalizing arrangements with the preferred turbine supplier. Metals recycler CMA Corporation made a net loss for 2011-12 of $75.6 million compared with a net loss of $123.6 million in 2010-11. Revenue from continuing operations was $238 million, down from $338 million. Managing director John Pedersen said the latest result reflects continued challenging global economic conditions as well as the Deferred Tax Asset write downs of $14.4 million and the impact of impairment losses which totaled $20.6 million. Net assets at 30 Jnue were $2.9 million. CMA said it has renegotiated financing arrangements and obtained debt covenant waivers from its financiers, GE Commercial Corporation (Australia) Pty Ltd (GE), Bank of New Zealand (BNZ) and Stemcor Trade Finance Ltd.
Tasmania's forests contain around three to four billion tonnes of carbon, about six times the amount of Australia's average greenhouse gas emissions profile, according to the findings of CO2 Australia's Tasmanian Forest Carbon Study. The study aimed to estimate the volume of carbon stored in the State's forest estates, which cover over 3 million hectares and 95 forest types. It was commissioned by the Tasmanian Government through the Tasmanian Climate Change Office. The study says that under different forest management and land use scenarios it may be possible to achieve greenhouse gas abatement worth tens of millions of dollars, and that carbon markets provide prospects for commercial carbon forest projects in Tasmania. The study looked at how forest management and land use practices affect carbon stocks, the level of carbon abatement from changes to those practices, and the commercial value of the various carbon storage levels. It also analyzes opportunities to monetize carbon sequestration and avoid emissions under various domestic and international carbon trading programs. Environmental Group recorded a loss of $9.2 million for 2011-12 based on operational losses of $0.4 million and write-downs and balance sheet adjustments of $8.8 million. New chairman Louis Niederer said the most significant loss was that of subsidiary, EGL Management Services Pty Ltd (EGLMS). This housed two wastewater treatment facilities, one at Wodonga in Victoria and one at Redcliffe in SE Queensland. EGLMS made a loss of $0.9 million for the year and EGL wrote off its investment in EGLMS for a further loss of $1.1 million. EGLMS is now with a liquidator. Mine Assist Pty Ltd, which operates in the Hunter Valley coalfields in NSW and the Bowen Basin in Queensland, was severely affected by industry cost reductions from reduced pricing for coal and iron ore and from wet weather in the Bowen Basin. These led to a wholesale restructuring of Mine Assist's cost base in Qld. The carrying value of Mine Assist was written down by $2.7 million. Mine Assist's revenue was $19.3 million, up 22 per cent on 2010-11. But it only broke even at the pre-tax level. Total Air Pollution Control Pty Ltd (TAPC) is expected to have a strong year in 2013. The remnants of the Gas and Vapour business are being merged with the traditional TAPC business. The board is confident the business will expand, he said. "Gas and Vapour recently won work in Vietnam, and is currently working with Olympic Dam (BHP), Mt Isa (Xstrata) and One Steel, to name a few. The division is a quality business with quality clients." TAPC made a profit of $1.1 million on revenue of $6.9 million. There was no write down although $0.9 million of capitalized R&D was written down in Gas & Vapour. In a long awaited sign that Australian governments may finally be starting to understand the commercialization of innovation, the Victorian Government has extended its feed-in tariff to include fuel cells. The move has been welcomed by Cermic Fuel Cells, which is the most obvious beneficiary. Victoria's solar feed-in tariff will be broadened to include all low-emissions and renewable technologies of less than 100 kilowatts, and which produce 50 per cent or less of the emissions intensity of electricity generation in Australia. From 1 January 2013, the new tariff will provide a minimum of 8 cents per kilowatt hour of electricity exported to the grid, a price based on the adjusted wholesale price of electricity. The rate will be updated each year in line with the adjusted wholesale price. Ceramic Fuel Cells' BlueGen gas-to-electricity generator will be eligible for this feed-in tariff, making Victoria the first Australian state to provide a feed-in tariff for fuel cells. BlueGen customers in Germany and the UK already receive feed-in tariffs. The German tariff is equivalent to about 14 cents per kilowatt hour (11.5 Euro cents), while the UK tariff is about 26 cents per kilowatt hour (17 pence). The Victorian Government accepted the recommendations of the Victorian Competition and Efficiency Commission (VCEC), which reviewed the feed-in tariffs. Ceramic Fuel Cells contributed to this process. Managing director Brendan Dow said "We hope that other States will follow Victoria's lead so we can further develop the market in Australia for our locally developed clean energy technology. In the meantime we will continue to build sales in our key markets of Germany and the UK." Carbon Polymers has raised $2.9 million in its rights issue and shortfall placement. Since June 2010, when the company was restructured, it has raised over $9.1 million, said chairman and managing director, Andrew Howard. "We are currently working on a debt facility for $2 million which will be used for further plant expansion. "We have been able to finalize the integration and capital costs associated with the Reclaim Industries plant acquisition, our resources are now focused on the company's production and achieving planned targeted output," he said. "The asset base of the company has increased from $5.9 million in 2010 to over $22.3 million. For the financial year ended 2012, CBP had less than $5.2 million of liabilities against liabilities in 2010 of $6.3 million. "Our revenues have grown approximately 700 per cent from the previous financial year and continue to grow. Lynas Corporation has received its awaited Temporary Operating Licence (TOL) for the Lynas Advanced Materials Plant (LAMP) from the Malaysian Atomic Energy Licensing Board (AELB). The announcement saw Lynas' share price spike from 56 cents to 95 cents. The TOL enables Lynas to commence transporting rare earths concentrate and prepare for first feed to kiln, expected in October. The AELB will monitor the plant's operations and adherence to safety standards. Compliance with these standards is necessary for conversion of the TOL to a full operating licence during the next two years. Lynas said it will exceed the rigorous standards of the TOL by removing from Malaysia the material that is the principal cause of the community anxiety and engage with export markets for the processed co-products from the LAMP. "Receiving this licence from the AELB is a significant milestone for Lynas," said Lynas' executive chairman, Nicholas Curtis. "The TOL provides additional validation of the safety of Lynas' operations in Malaysia and supports the previous assessment by the world's pre-eminent radiation safety authority, the International Atomic Energy Agency, that the LAMP is safe and fully compliant with international standards. "The approval to begin operations also verifies Lynas' continued commitment to strong safety, health, environmental and community values and highlights the company's determination to achieve its Zero Harm goal. This commitment extends from the current design and construction of the LAMP through to commissioning, operations and expansion. Dart Energy has been awarded the Bontang Bengalon coal bed methane block in East Kalimantan, Indonesia. A Production Sharing Contract (PSC) for the block is expected to be signed with the Indonesian government within one to two months. The block covers 410 square kilometres and is divided into two areas: the southern part is adjacent to the Bontang LNG facility, and the northern part is 62 kilomteres north of the facility and adjacent to the Sangatta West PSC, in which Dart is a net 24 per cent participant and joint operator. Dart will be operator of the block with a 100 per cent working interest. The PSC will be for 30 years. An initial three year exploration period is expected to commence in mid to late 2013. AnaeCo has begun mobilizing its commissioning team for the Western Metropolitan Regional Council DiCOM Expansion Project in Perth. Pre-commissioning is already underway in some areas. BluGlass has been allowed another semiconductor patent from the US Patent and Trademark Office. This covers part of the fundamental process of growing group III metal nitride film. This brings BluGlass' granted international patents to 16. In a new project, Geodynamics and Gulkula Mining Company Pty Ltd will together investigate the potential for a direct heat geothermal project in the Gove Peninsula in the Northern Territory. Gulkula Mining Company is a subsidiary of Gumatj Corporation Ltd, the commercial arm of the Gumatj clan, who are the traditional owners of land within Geothermal Exploration Permit (GEP) 28310 where the project will focus. The 50-50 joint venture will investigate the potential to deliver heat to the Rio Tinto owned Pacific Aluminium alumina refinery, focusing on Gumatj land that is adjacent to the refinery. The use of geothermal generated direct heat would allow Pacific Aluminium to reduce oil consumption and carbon emissions and may deliver reduced costs and enhance the sustainability of the bauxite refinery at Gove. Initial exploration has identified potentially high heat producing granite formations that may host a commercially viable large scale direct heat resource. These granites are shallower and lower in temperature than the granite formations Geodynamics has been developing at Innamincka in the Cooper Basin. Exploration work for the Gove Peninsula Geothermal Project will begin with geological field work and temperature gradient measurements before initial drilling to assess the viability of the geothermal heat supply. Managing director and chief executive officer, Geoff Ward, said "This is an excellent opportunity for both Geodynamics and Gulkula Mining to explore the prospect of developing a commercial geothermal project consistent with the aims for sustainable development in the region." On behalf of Gulkula Mining, Gumatj clan leader and former Australian of the Year, Galarrwuy Yunupingu AM said "This agreement is a good example of a new style of relationship between traditional owners and resource companies. Traditional owners no longer seek to just negotiate royalties and rents  we seek partnerships that give us ownership and an interest in every aspect of the business; we want in on the economic world." "The supply of affordable energy heat as well as power is a challenge in remote areas in Australia like Gove that are reliant on imported liquid fuels. We have recognized geothermal energy as a potential sustainable alternative to existing fossil fuel energy sources that can support the long term future for businesses in this region." Under the Heads of Agreement, Geodynamics will provide the initial $200,000 to develop an initial exploration plan and business plan and pay initial permit fees. Geodynamics will also issue 500,000 fully paid shares to Gulkula Mining. Gulkula Mining will assist to secure with the Northern Land Council the agreements and consents for a targeted exploration project. Shares in geothermal explorer Hot Rock touched an all time low of 1.5 cents on 5 September. Two days later the company announced that partner, Energy Development Corporation (EDC), would not proceed with the joint venture at the Chocopata project in Peru. However, EDC still intends to proceed with detailed field work programs at the Quellaapacheta project and is mobilizing personnel and contractors to commence work around the 22nd of September. Work will consist of geological, geochemical and geophysical magneto-telluric (MT) surveys and is expected to be completed by mid-November. Under the Quellaapacheta agreement, HRL will receive an initial cash payment of US$0.4 million after the exploration tenement is transferred into a newly incorporated JV company, which is estimated to take a further two to three months. If EDC withdraws from the project within six months of the tenement being transferred to the JV company, the $0.4 million is refundable. A further payment of US$0.6 million will be paid if EDC continues with the project past an initial 15 month period. EDC is to sole fund up to US$12 million for surface exploration and deep exploration drilling activities before the EDC (70 per cent) and HRL (30 per cent) pro-rata contributions for any future development. Shares in Petratherm fell to an all time low of 3.4 cents on 6 September. A day earlier Petratherm said it had been invited to submit a project funding application under the Australian Renewable Energy Agency's $126 million Emerging Renewables Program for the next stage of works for the Paralana geothermal project. On behalf of the joint venture partners, Petratherm will apply for a $13 million grant to fund about half of drilling for the Paralana 3 deep well, fracture stimulation of the well and demonstration of flows between the Paralana 2 and 3 deep wells. The company said that over the past several months it has been exploring potential funding to enable it to proceed with the next stage of the Paralana geothermal project. This has included potential flexibility under existing grants of $7 million under GDP and $62.8 million under REDP awarded to the project as well as new grant opportunities. It concluded the most appropriate way for significant funding is a new grant under the Emerging Renewables Program (ERP). The ERP program has two stages  an Expression of Interest (EoI) stage and a Project Funding Application (PFA) stage. Petratherm submitted an EoI and has now been invited to submit a PFA. The company is also looking at other ways to find its share of JV funding for the next stage of the project. If it is successful with the ERP grant, then it is expected the unused $2.8 million of the GDP grant would be relinquished.